Blurry Vision - Cataracts or AMD? It is not uncommon as we age to experience some blurred vision - facial features aren't as distinct as they used to be or perhaps words are not as sharp and crisp as they once were. You try cleaning the lenses of your glasses thinking perhaps that's the problem or make an eye appointment to see if you need a new eye glass prescription. 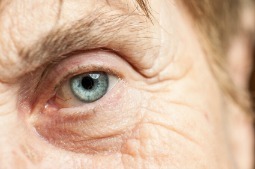 Both of these eye conditions are common in the senior population. According to the National Eye Institute "By age 80, more than half of all Americans either have a cataract or have had cataract surgery." The American Macular Degeneration Foundation reports, that AMD is "the leading cause of vision loss for those aged 55 and older in the United States, affecting more than ten million Americans." Blurred vision is not the only shared symptom of cataracts and AMD. Colors are not as bright and vivid as they once were and glare causes eye discomfort.